Stephen Smith, CEO and President of Wiley, will be a featured speaker at this year’s Frankfurt Book Fair. Stephen M. Smith, President and CEO of Wiley, will be delivering the keynote address at Frankfurt Academy’s CONTEC conference on October 8 at 8:40 a.m. at the Frankfurt Book Fair. He will also be the featured trade speaker at the opening press conference of the Frankfurt Book Fair. The global education, research and journal publishing company Wiley has made significant progress in the transition from print to digital. Today, more than 50% of Wiley’s annual revenue is derived from digital content and services, and in some business lines as much 70% of revenue is digital. “However, as important as that migration from print to digital is for the sustainability of our core business, we recognize that digital books and journals at best substitute revenues previously derived from their print predecessors,” says Stephen M. Smith, Wiley’s President and CEO. 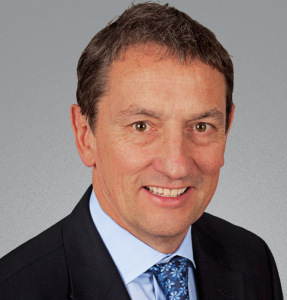 Smith joined Wiley in 1992 as vice president in charge of Asia, and served in a variety of roles before taking over as Chief Operating Officer from May 2009 until May 2011, when he was appointed CEO — and as such has had a front-row seat to the vast changes sweeping the industry. He shared his views on the digital transition with Publishing Perspectives. In the rush toward digital publishing and the constant talk of “innovation,” has the “digital revolution” been overhyped? On the contrary. We are all familiar with Amara’s Law that states “we tend to overestimate the impact of technology in the short term and underestimate its impact in the long-term.” I believe that things have changed so rapidly and profoundly that there is a risk that leaders of traditional media companies might underestimate the significance of the revolution that is already upon us. I also believe that to characterize the revolution as a transition from traditional media to digital over-simplifies the complexity and impact of the changes ongoing in our business. In order to drive growth, we need to go beyond the ‘two-dimensional’ experience of a digital journal or standard ebook and find ways to expand along the value chain of our customer, thereby opening new revenue streams and tapping into alternative sources of funding. Take for example the world of peer-reviewed scholarly journals. Wiley launched its first online journals platform (Wiley InterScience) in 1999 and has signed digital license agreements with customers around the world that now account for over 80% of total journals revenue. Even though digital journal content is of much greater value to libraries and researchers and despite the fact that usage and availability of content continues to expand rapidly, revenue growth remains constrained by the relatively slow growth of institutional library budgets. The ability to offer digital content is a ‘price-of-entry’ for journal publishers in today’s library market, but we need to go beyond digital content to develop higher-value services, tools and solutions in order to deliver acceptable growth. Furthermore, with library budgets under-pressure and the emergence of an ever more demanding and tech savvy customer base, we will need to continue to invest significantly to enhance the value of our digital content and delivery platform and drive greater usage. Funding that additional investment will require accelerated revenue and profitability growth from alternative, non-library revenue streams. Through organic development, partnership and acquisition, scholarly publishers like Wiley are developing new businesses that lever the content, brands and relationships of our journals, providing workflow tools and solutions that enhance research productivity, facilitate researcher collaboration and deliver improved return on investment for R&D funders. How about in education and professional development? In higher education, through the acquisition of Online Program Management business Deltak, we now serve institutional customers along the entire value chain of online learning. We have expanded from being a provider of curriculum support and content to become a provider of ‘turnkey’ end-to-end solutions that include market research, student recruitment, faculty development, content hosting, 24/7 student support, platform delivery and assessment. By combining Deltak with our traditional strength in textbook publishing and digital course development Wiley is emerging as an integrated Educational Solutions Provider. This transformation, from a publisher focused on selling individual adoptions at the faculty level, to a knowledge services provider that offers institutional level services, represents a profound change for our company and our colleagues. What is the risk involved in abandoning legacy businesses? Even as we seek to develop new higher-growth businesses by expanding along the value chain of our customer, we have no intention of ‘abandoning’ profitable legacy businesses. We expect to diversify our business through the addition of new content-enabled services, but publishing will remain at the core of everything we do. Our deep reservoir of highly-regarded content, our enduring relationships with authors, end-users, partners and customers as well as our portfolio of trusted brands, give us deep insights into the needs, pain-points and preferences of a wide-range of educational, professional and research communities. The deep knowledge of customer needs that arises from our legacy businesses provides an essential foundation for the development of new businesses. To the extent that legacy businesses remain profitable and yield positive cash-flow, they can provide important financial resources to support innovation and investment. Traditional publishing businesses around the world are facing revenue challenges. Print book sales are declining rapidly and, although digital books sales have grown, the rate of growth is not sufficient to offset the rate of decline of print. Although digital device penetration continues to drive demand for e-books, users of tablet PCs and other mobile devices are offered a bewildering array of alternative content that competes for attention and ‘share of wallet’. Furthermore, digital business models tend to be weaker than their print precursors. Some content that used to be purchased by the reader in book format is now available in good-enough substitute versions, often paid for through advertising or other ‘free to end user’ business models. (It was this trend that led Wiley to divest its travel, culinary and other consumer publishing businesses in 2012). Lastly, the changes in the consumption and delivery of content have changed the balance of power between content owners and creators, device manufacturers and distributors, with publishers and content owners sometimes left with a declining share of the action. So what is the answer for publishers? Faced with these changes, traditional publishers must innovate to survive. They must reduce their dependence on the traditional ‘one-to-many’ distribution models that have sustained them in the past and must develop new ‘one-to-one’ or perhaps ‘one-to-few’ models that deliver customized and personalized experiences for their readers. They must develop enduring relationships with their final customers and enhance their knowledge of the customer to guide higher-value product development and marketing capabilities. These changes, which require significant cultural shifts in the publishing enterprise, I would characterize as ‘fundamental’. As a manager, how do you prioritize the demands on “scarce resources” — and which way is Wiley weighting the future? Toward legacy, or toward something new? It cannot be ‘either/or.’ As difficult as it might sound we have to increase efficiency and return-on-investment from the legacy business while investing in innovative new businesses that are essential to our future viability. Staying competitive and staying relevant means changing what we do, but the change cannot be an abrupt switch from old to new. We will succeed by exploiting current opportunities while simultaneously exploring new ones. At Wiley, we have set ourselves a goal of achieving 25% or revenue from transformational new businesses that engage the customer in an interactive, multi-dimensional experience. This means that 75% of revenues will still be derived from our (increasingly digital) legacy books and journals business. In order to make sure that we build on our current strengths and assets, and to ensure that we engage talented colleagues across the company in vital innovation and new business development it is vital that new growth businesses and legacy businesses not be treated as organizationally separate. Colleagues who currently run book and journal programs at Wiley possess deep customer knowledge within their specific domain or discipline. We are focusing a lot of effort to help those colleagues rebalance their energy and resources, encouraging them to think more broadly about how they can develop new products and services that address the needs and pain points of their customers. We are asking them to use their knowledge of workflows to think about the context in which our existing products are valuable to customers. What is a customer doing immediately before they turn to a Wiley product? What do they do next? Naturally, encouraging colleagues with traditional publishing skill sets to think more broadly about customer workflows requires re-training and skills development. We also need to allow them to free-up time and resources by streamlining the legacy business, eliminating redundant and bureaucratic processes. If we are successful in this, we expect to see further benefits in a more engaged workforce. We have an opportunity to provide people with higher value-added and more rewarding jobs. The legacy business has to be made more efficient in order to free-up resources for innovation and new investment. The resources and infrastructure that support declining or uncertain revenue streams must move rapidly from a fixed to flexible cost base, requiring tough decisions to offshore and outsource certain activities. Today for example, print books account for just 31% of Wiley’s total global revenues, down from over 50% a few years ago. That proportion is expected to continue to decline, and yet Wiley still has significant capital and resource tied-up in print distribution centers around the world. This combination of falling demand and fixed-capacity is unsustainable and we have therefore taken measures to outsource distribution in some locations to a third-party provider, enabling us to align cost more closely with the trajectory of the business it supports. There’s an old saying “The best way to predict the future is to invent it,” so what is Wiley’s vision of the future for its core publishing products and what is it doing to invent it. Wiley is transforming from a publishing business to become a global provider of knowledge and knowledge-enabled services designed to improve outcomes in research, professional practice and education. Content and publishing will remain at the core of our future vision, but we will invest in creating new products and services that engage the end-user in more interactive, personalized and relevant experiences.